I first read Harry Potter and the Sorcerer's Stone in October of 2000, quickly catching up on the series and then eagerly awaiting each new volume and devouring them as they were published. But it's been a very long time and I wanted to relive the magic, this time on audio. From the very beginning I was delighted to experience this story again. I had forgotten lot of the details, particularly at the very beginning. The novel opens the night Harry's parents are killed and he is left to live with the Dursley's, though in my memory it only began just before he left for Hogwarts. I had forgotten about the letters Hogwarts sent him that the Dursleys wouldn't let him read, and the lengths to which they tried to escape the numerous continuing letters. Nor did I remember that it was Hagrid who Harry met first, who hunted him down on an island the family tried escaping too. As Harry sets off for Hogwarts, he meets the Weasleys for the first time. Oh, the Weasleys! It was with glee that I thought about how close he and Ron would become, and with a bit of sadness that I thought about how not all of the siblings would survive the series. When Harry and Ron first meet Hermione they don't like her, but of course become good friends during the course of the book. And the foreboding first encounters with Draco Malfoy! And Professor Snape! And all the other professors and new classmates. Harry's first exposure to magic, first time riding a broom, first time playing Quidditch was all fun to experience again. It was so bittersweet to read about these early days, knowing everything that would happen later. 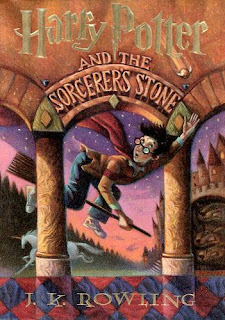 Jim Dale has a good reputation as a narrator, though some people I know had problems with how he did Hermione's voice. It didn't bother me though. I was instantly struck by his pronunciation of Voldemort (the "t" is silent), which I didn't know was the correct pronunciation until a few months ago. Why has this been a secret when the audio book has existed for so long? At any rate, this was altogether a great choice for audio! I've blown through most of my Audible credits a little more than halfway through the year so I'm trying to take advantage of audio books that I can download for free through the library. That's how I got Sorcerer's Stone, and I'm now on hold for Chamber of Secrets. In the meantime, I also bought The Night Circus which was on sale through Audible for $3 or so and is also read by Jim Dale. I'm not actually sure if I'll listen to the entire Harry Potter series. I hope so, but some of the later books are pretty long so that might be a challenge since I don't do well with long audio books. Whether or not I finish, it's a lot of fun right now!